Honestly, I really had no intention of collecting overo Paint geldings. But I’ve ended up with two of them. Yes, I bought another horse. I decided to buy the tall black and white Paint I tried a while back. I promised myself that I wouldn’t buy another horse unless I felt my heart drawn to it. I wanted the horse to “speak” to me just as Wally, my somewhat cantankerous yet lovable red and white beast, had spoken to me. I knew Wally was the horse for me when I tried him. And I wanted to have that same sense of assurance again before I plunked down a wad of money. Turns out that Danny—the black and white horse—had been speaking to me. I just wasn’t ready to listen. After all the horses that I called on or tried, Danny was the only one who stuck in my mind. It seemed like it was meant to be. So he came to live in my backyard. 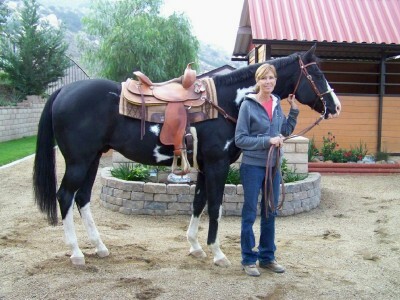 Danny was the horse I tried who was nice to ride but covered with bumps and yuckies from an uncontrolled fly allergy. He was also in need of a shoeing job. Plus he was very rusty on his arena work. After I weighed the pros and cons, I ended up walking away from Danny initially, certain that I could find an even better horse for the price. Well, that didn’t happen. Trust me. I think I either called on or looked at every trail horse for sale in the greater Southern California area. At some point I’ll share my misadventures with you, but for now let’s just say I was treated to more than my share of misrepresented horses and nice but misinformed sellers. (Note to the lady with the roan mare in Bakersfield: Really, when your horse bobs its head with every stride at the trot, it’s lame. It doesn’t “just move that way” naturally). I have to admit that I also felt a bit sorry for Danny, which was undeniably the determining factor in my buying him. I have a soft spot for hard luck horses. He’d spent the last five years as a family horse, owned by a part-time riding instructor and her husband. They were both sidelined with severe health problems, however, and poor Danny was left to stand idle for months until he was sent to the ranch where I saw him. While there he was tuned up and offered for sale to someone who’d provide a good home. As it turned out, that would be me. Yet instead of being thrilled with a new horse, one that would be the yin to Wally’s yang, I was incredibly anxious. Aside from Wally, I hadn’t had much luck in buying horses since I’d left the world of high-performance show horses. 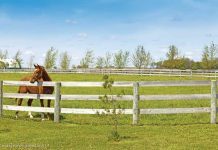 I was terribly afraid of getting attached to a horse only to discover it reared, had chronic soundness issues or acted like a four-legged suicide machine on the trails. Fortunately the gal who was managing the sale for Danny’s owners took pity on me. She offered me a 30-day trial. If Danny didn’t work out, or if my vet thought that the fly allergies and skin problems weren’t treatable, then I could return him and swap him for one of the other horses at her ranch. That seemed like a generous offer that I couldn’t pass up. And thus Danny came to live in my backyard a few days before Halloween. He settled in right away. With my vet’s guidance I went to work on the superficial skin infection, which was cleared up in just a few days. My farrier went to work on his feet. And after some consistent work in the arena, Danny remembered much of the professional training he had years ago. From the first day he ambled down the trails at a pleasant, jaunty walk. Danny is remarkably gentle, a kind soul that seems even older than his 11 years, and he’s trustworthy around my husband, who is thrilled that he finally has a horse in his backyard who doesn’t try to eat him. (Yes, I’m talking about you, Wally). I’m happy that I overcame my initial reluctance and bought Danny. He’s mine for good. Yet don’t think that there weren’t a few surprises along the way to this state of bliss. More on that in my next blog post. Oh, what a handsome boy! Congrats to you and Danny. Oh, he’s beautiful!!! Congratulations, I hope he’s the ONE. After I read the first post about when you tried him out I really couldn’t believe you would walk away from him ( for good). It sounds like he is a good match and he isn’t bad to look at either! how tall is he he? looks pretty big for a paint. Hmmmmm….reminds me of my horse. A lovely tobaino paint with a sweet expression Quincy is. Unfortantly he does have chronic lameness issues. Quincy. Not Danny. Good Luck! i hope you and Danny have a good long life with Wally. I love all your blogs! God bless! I GUESS I WAS JUST A LITTLE GUN-SHY AFTER HAVING A COUPLE OF STABLE MATES FOR WALLY THAT DIDN’T WORK OUT. I’M ONE OF THOSE PEOPLE WHO FALL IN LOVE WITH A HORSE AND THEN GET THEIR HEARTBROKEN EASILY. BUT DANNY IS A KEEPER. HE EVEN EATS APPLES RIGHT OUT OF MY HAND…. WITHOUT ALSO TRYING TO EAT MY HAND! YES, HE IS TALL. HE’S RIGHT AT 16-HANDS, WHICH MAKES HIM NICE TO RIDE ENGLISH, TOO. HE LOOKS LIKE HE HAS SOME THOROUGHBRED IN HIM, BUT NOPE. JUST PAINTS AND QUARTER HORSES IN HIS PEDIGREE. I might have missed something but didn’t you have a palomino mare? What happened to her?